Originally inspired by the system, called "Shinmoon-go" from the early 15th century Korea, reporting to the king unfair treatment of subjects by authorities, this project uses the drum wearer as a social media through which the pain and unfairness felt inside the public can be spoken out. 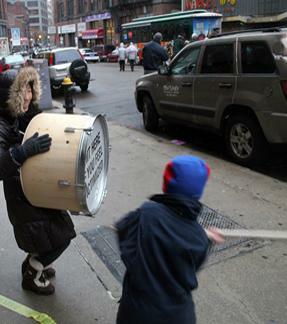 The drum has the message "Hit Here If You Feel Victimized" on it, and the wearer roams around from place to place such as the Boston Common, the historical place for speaking out, and Chinatown where immigrant populations reside. Anyone is invited and encouraged to hit the drum. The sound of the drum symbolizes the release of the inner pain. The act of hitting the drum becomes the healing ritual since many people, including the drum wearer, responded that they “felt much better” afterwards.